Wednesday was packed with an onslaught of app updates, many of which came with at least a few notable features. While a bit on the quiet side, the Play Movies & TV app came with some worthwhile new features of its own. 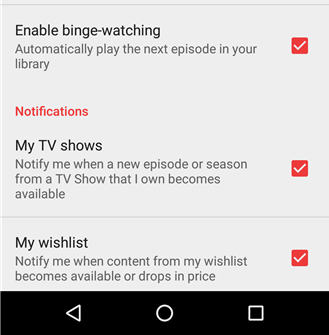 Most of the new features are hidden under the Settings screen, including a toggle to finally shut off binge-watching on phones and tablets and a pair of options to enable notifications for new TV shows and when things on your Wishlist become available or drop in price. There are also a few other subtle differences behind the scenes. An update back in early October brought binge-watching, which filled in a popular feature for serious TV watchers. 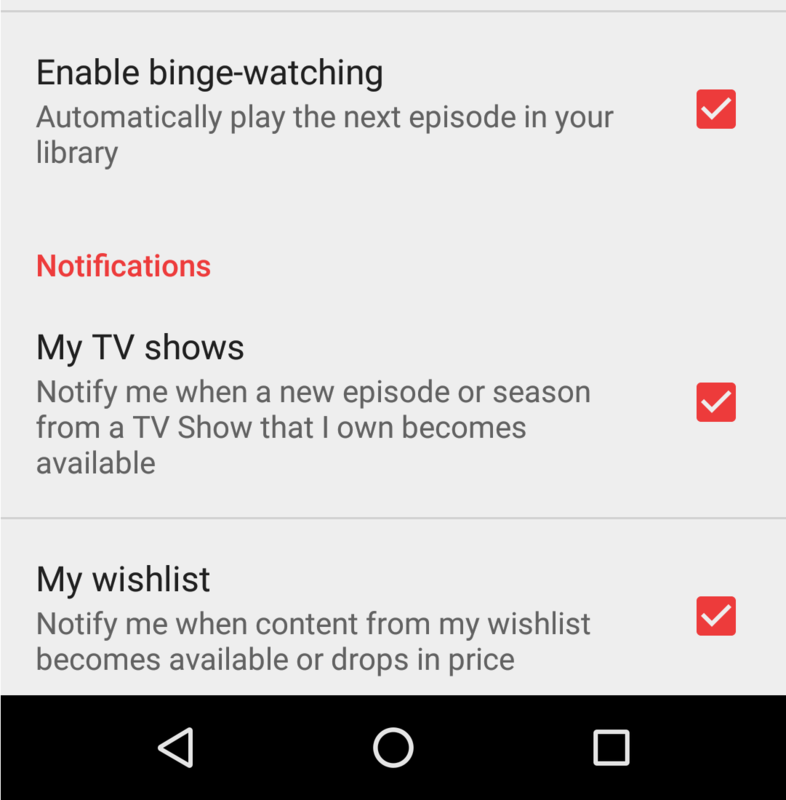 Shortly thereafter an update to the Android TV version brought the same feature, but also included an option (in Settings) to disable binge mode for those who would prefer to watch one-and-done style. The main app is finally catching up with a toggle of its own. If watching one episode after another isn't quite to your taste, pop open the Settings screen and shut it down for good. I think a pair of new notifications may be the biggest feature of this release. The first can now give notifications as new episodes or seasons become available for shows you currently own. This means it's easier to keep up with shows that are still airing, especially those that take extended breaks between or during seasons. The more interesting notification will let you know when movies and TV shows on your Wishlist become available or drop in price. Perhaps the biggest reason this is special is because it marks the first time that the Play Store Wishlist feature has been useful as anything more than a bookmark. If there's a movie or show that you'd really like to pick up, but the price feels too high, just put it into your Wishlist and wait for a sale. This can also work a lot like the pre-registration feature added for apps and games back in May. If you see a movie or show listed, but it hasn't been released yet, just add it to your list and get a notification when the video is ready to watch. The rest of the changelog contains some things most of us probably aren't going to notice, including more reliable playback – not that anybody would ever complain about that. Play Movies & TV will also show up as a channel in the Android TV Live Channels app, if you have a TV that makes use of that. The idea is that you'll be able to see streaming options alongside live programming without having to switch between a bunch of apps. Finally, there is also a new onboarding animation that looks fairly slick, but that's more for the first-time users or anybody setting up a fresh device.